While removing the steering column assembly, do not unlock the tilt lever. Do not impact on the axis when removing steering column assembly. Be careful when removing steering column assembly from the vehicle because it is heavy. Keep steering column assembly away from magnetic sources. Do not disassemble steering column assembly, it is all one piece. 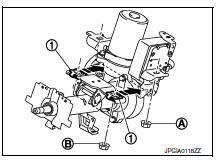 While removing the steering column assembly, do not move the steering gear assembly. When removing the steering column assembly, be careful not to allow the lower shaft assembly to turn. Set steering wheel to the straight-ahead position. Place the tilt to the lowest level. Securely lock the tilt lever. Remove instrument lower panel LH. Refer to IP-21, "Removal and Installation". Remove driver air bag module. Refer to SR-12, "Removal and Installation". Remove steering wheel. Refer to ST-10, "Removal and Installation". Remove steering column cover. Refer to IP-16, "Removal and Installation". Remove spiral cable. Refer to SR-16, "Removal and Installation". Disconnect key interlock cable (if equipped). Refer to TM-260, "Removal and Installation". Remove lower side bolt of lower shaft assembly. Disconnect each harness connector and harness clips installed to steering column assembly. Disconnect EPS control unit harness connectors. Remove the steering column assembly nuts. When removing the steering column assembly nuts, be careful not to drop the steering column assembly. Remove EPS control unit. Refer to STC-39, "Removal and Installation". When installing the steering column cover, check that the vehicle harness is not stuck in the cover. 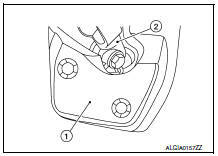 After tightening nut (A) of the steering column assembly, press in slide plate (outer and inner) (1) to tighten nut (B). Do not reuse slide plate. The slide plate must be securely pressed in before tightening the nut of slide plate. Lower shaft bolt is directional. Refer to ST-12, "Exploded View". Do not reuse lower shaft assembly bolt. 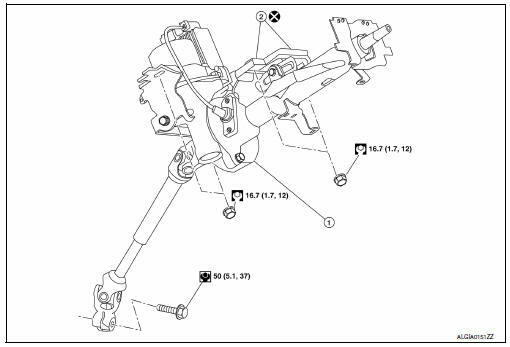 After installing steering column assembly, perform self-diagnosis with CONSULT to ensure correct operation. Refer to STC-10, "CONSULT Function". Perform inspection after installation. Refer to ST-7, "Inspection".